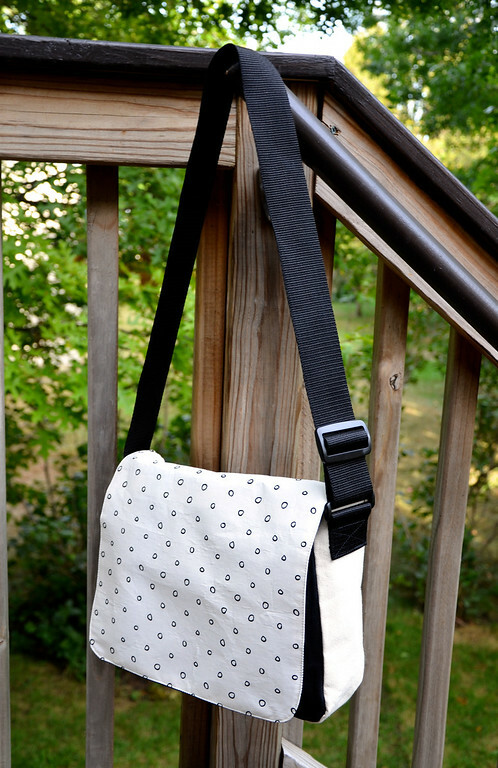 Alright, so they're more popularly known as messenger bags but I grew up calling them satchels. Unlike traditional satchels, however, these aren't leather. 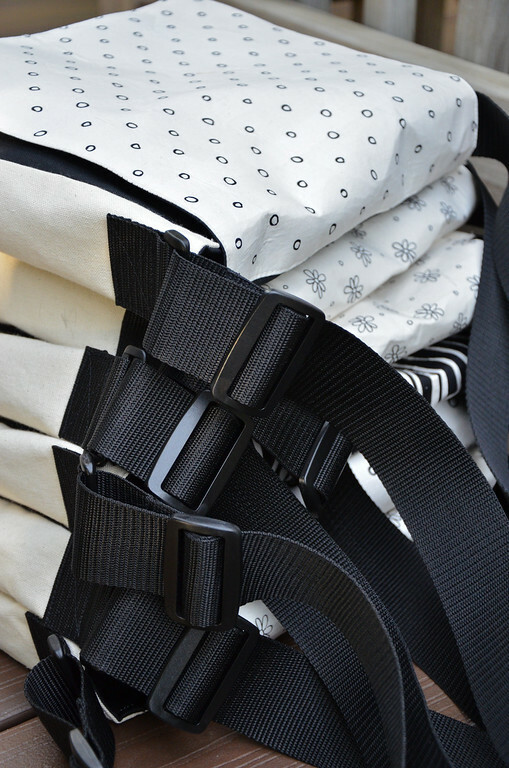 They also have no buckles because I was mass-producing them for kids - I wanted to save time and wasn't convinced that kids were going to actually use the buckles. 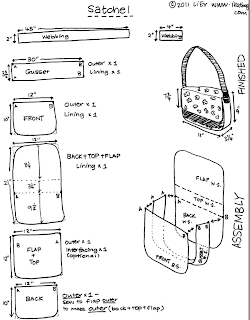 There is absolutely nothing original or creative about the basic design of satchels. Everyone is making them. 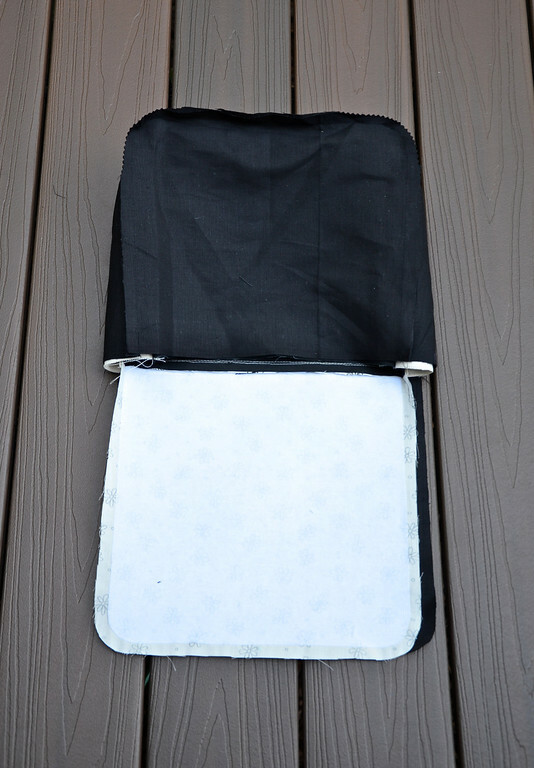 They're rectangular pouches with narrow gussets and a flap that overhangs the front. Or, instead of gussets, they might have pinched corners. 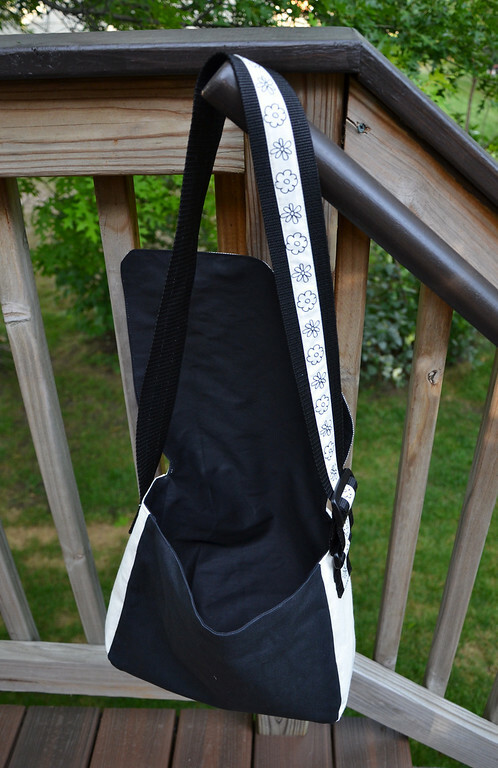 They have long straps that cross diagonally on the body to suspend the bag. Sometimes they have pockets and buckles. Whatever the variation, they are fun to carry, easy to make because they are rectangles and can be floppy and therefore don't require interfacing. I made my satchels as goodie bags for Emily's party. Guests often decorate goodie bags, right? So we decided they should also decorate these satchels. 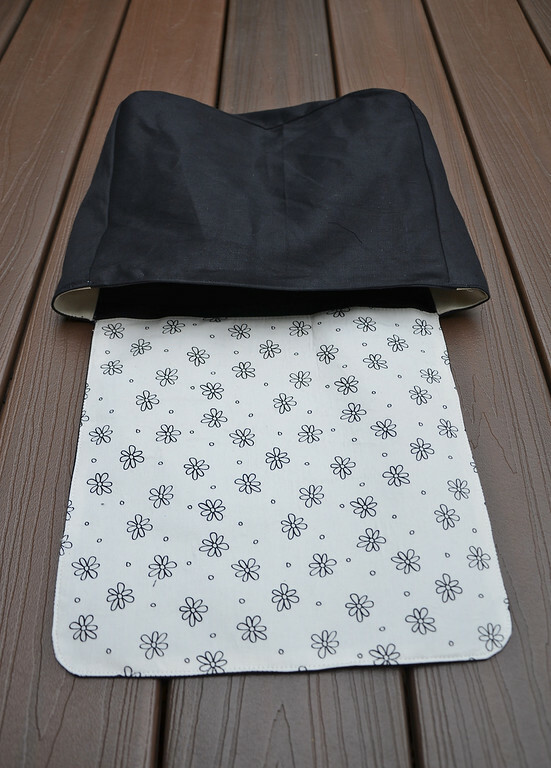 The fabric for the front flaps are from the Color Me line sold in many stores. 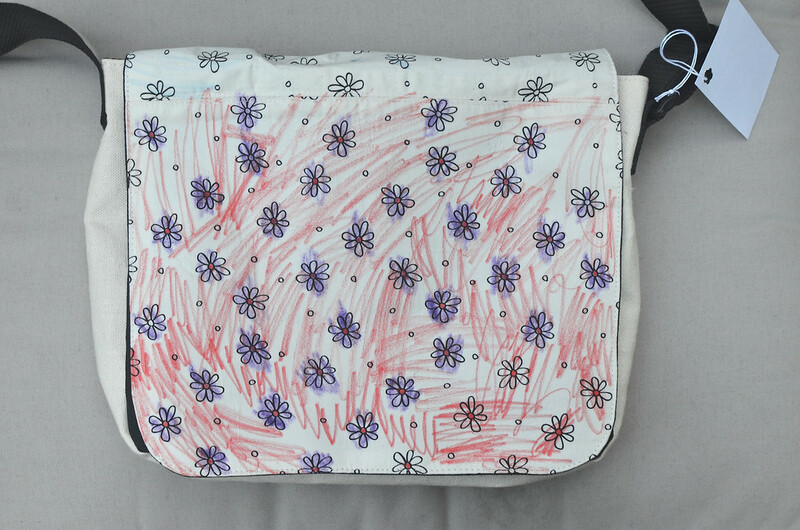 Rather than plain canvas satchels for the kids to draw random art on (also a nice possibility, but maybe for older kids), these fabrics have little printed motifs so all the kids need to do is color. 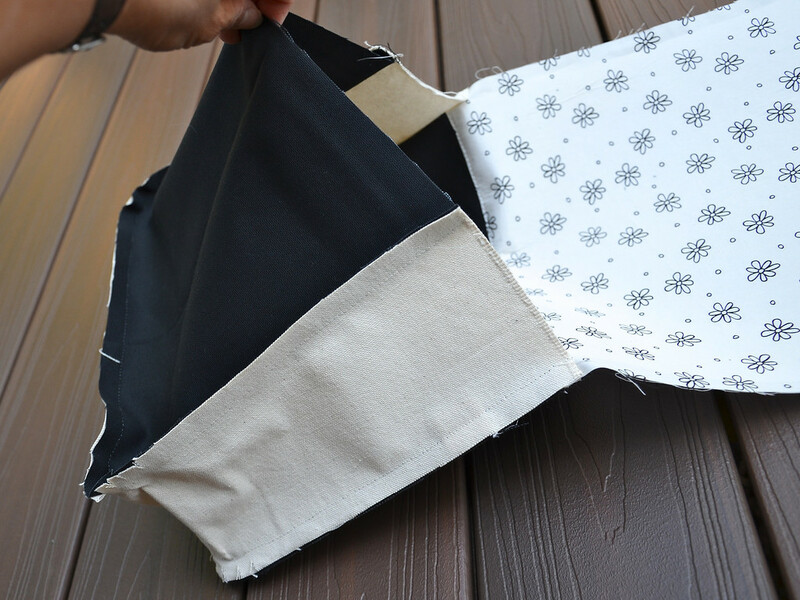 The Color Me fabrics are very thin - lighter weight even than quilting cotton so I had to interface them with fusible craft-weight interfacing to make them sturdy enough for the kids to color on. 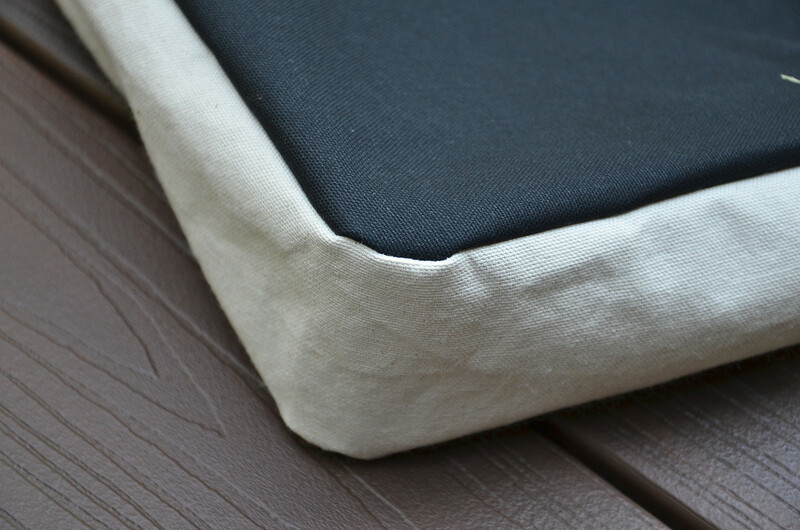 Fortunately that was the only part of the bag that needed stabilizing - the other fabrics are duck cloth and canvas for the outer layer, and twill for the inner layer. Very robust, overall. The strap is nylon webbing. 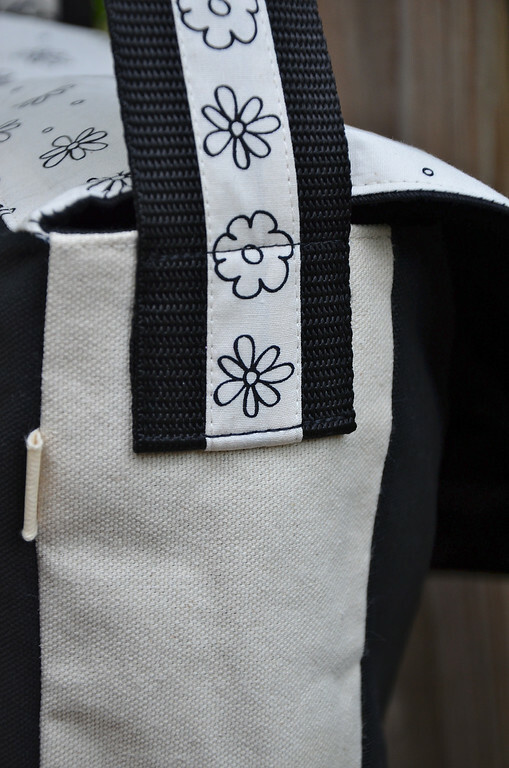 It's adjustable with a plastic slide, so the kids can wear the bag in whatever way and at whatever height they like. Click on the diagram above to download the instruction sheet. All the dimensions include seam allowances, and wherever you see rounded corners, just cut the rectangles to size and round off their corners, okay? I repeat, I DO NOT HAVE A PATTERN for the rounded corners. Here are some behind-the-scenes photos. Working with just the outer fabric(s) layer, the first thing I did was to sew the flap to the back of the bag to make a continuous flap+top+back piece. Then I sewed one edge of the gusset to the front of the bag, and then the other edge of the gusset to the back of the bag. I now had a complete bag, made out of the outer fabric(s). 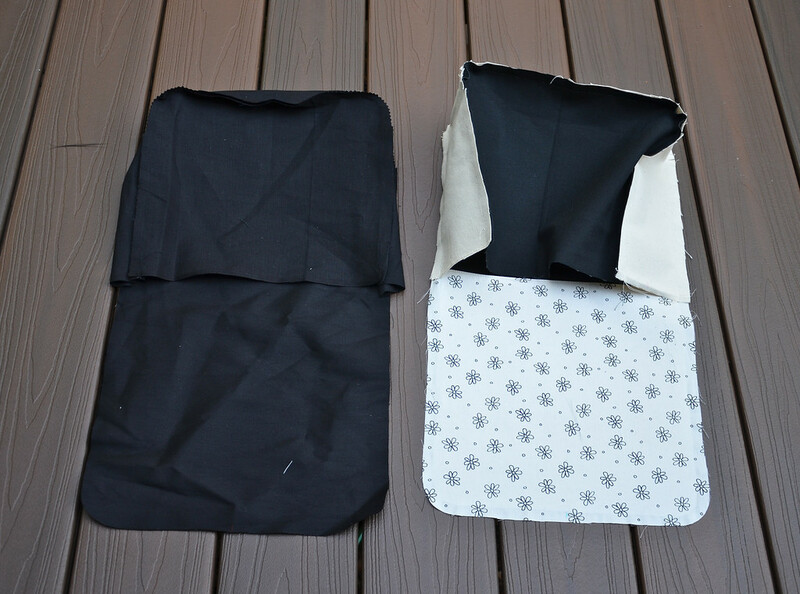 Then I made the lining of the bag in exactly the same way. So now I had two bags - one in outer fabrics, and one in lining fabric. 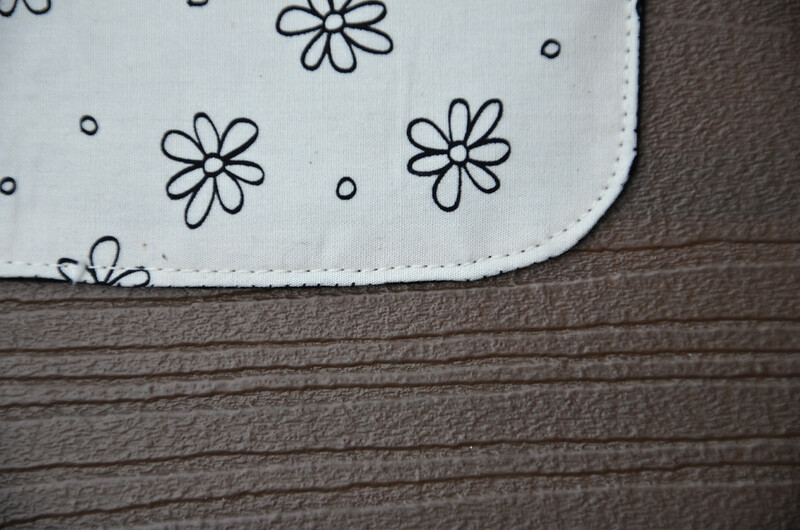 and fitted it into the lining (which was still wrong-side-out). 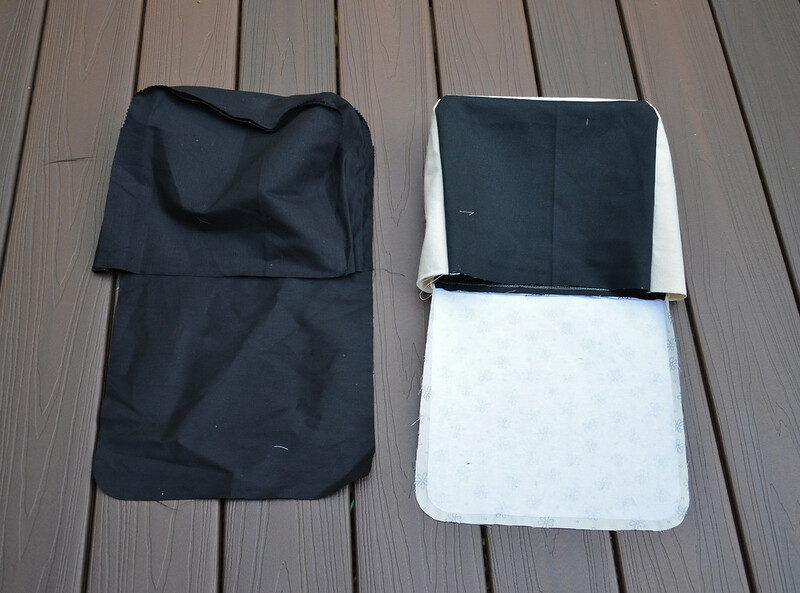 Then I sewed all around the free/unattached edges to attach the two bag layers to each other. I left an opening in the lining to turn everything right side out eventually, though. 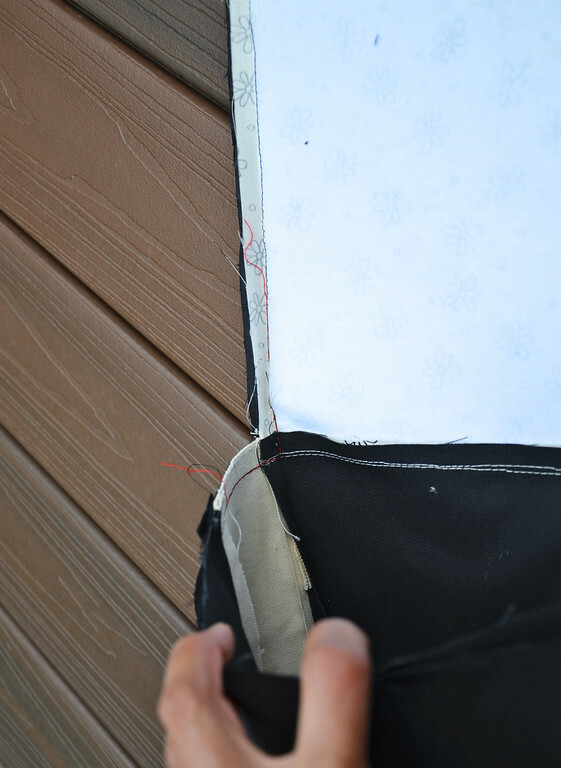 Here is an overexposed shot showing how I sewed that funny corner where the gusset intersects with the top+flap of the bag. And here is that corner again, with lurid red thread showing the stitching line. Then I snipped that corner, turned the entire bag right side out through the opening in the lining and top-stitched all around the edge of the bag. Then I made the strap system. If you want to further simplify it, omit the buckles. 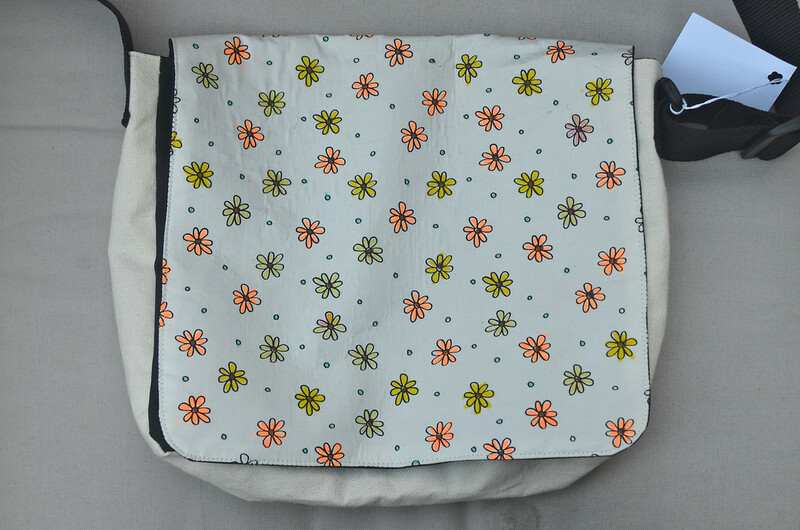 Just make a strap of a fixed length and sew both ends to the corresponding sides of the bag. 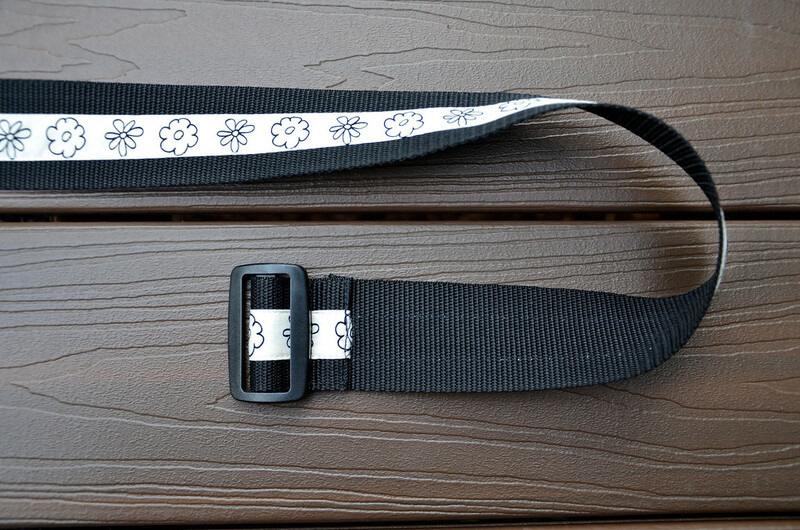 For clarity, I sewed on a strip of fabric to distinguish the right side of the strap from the wrong side. The short 4" piece of strap goes with the rectangular loop buckle and the long 45" piece of strap goes with the one-bar slide buckle. 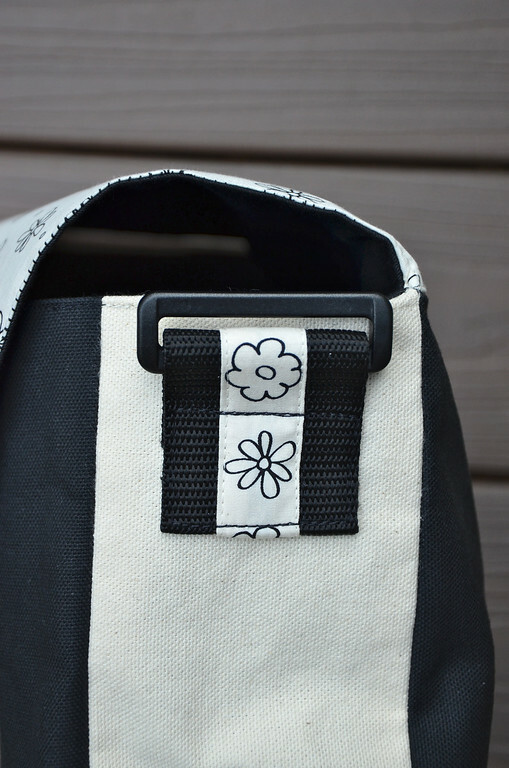 This is how the loop-and-short-strap are attached to the side of the bag. I tucked the fraying edges of the strap between the webbing and the gusset. 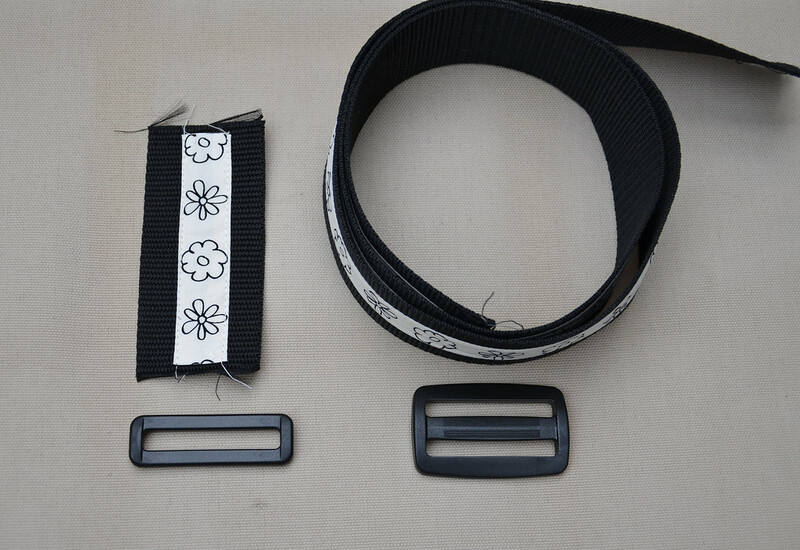 This is how the slide buckle and the long strap go together. 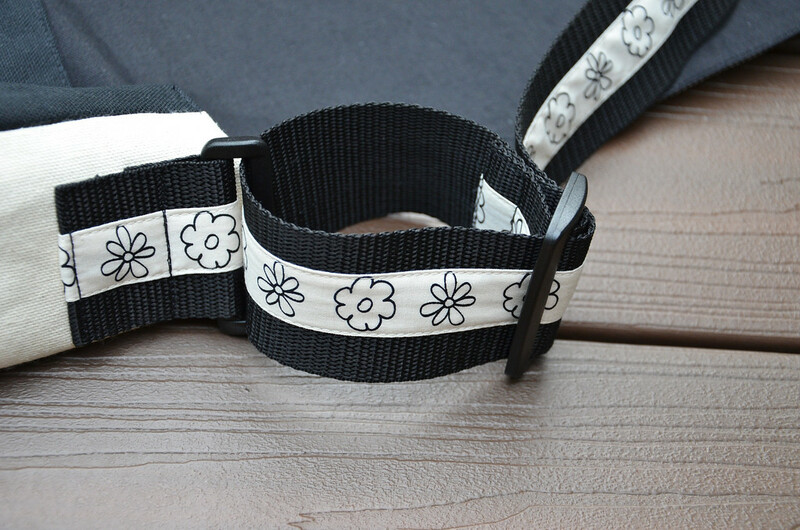 Sew the strap around the middle bar of the buckle. and sew that free end to the other side of the bag gusset. This is what the strap-and-buckle system looks like. And this is what the inside of the bag looks like. And then I made thirteen more, one of which was sized down a little (and with a narrower strap), for Kate. These other thirteen all have plain straps. I trimmed just that one fancy strap for Emily, being the birthday girl. I'd have liked to trim them all because it's such a pretty detail, but I didn't want to take the extra time. Actually, if I weren't mass-producing them, I'd have done them quite differently, and added piping and more rugged top-stitching and front buckles and inner pockets and outer pockets for iPhones and water bottles and hidden panels and whatnot. But for fourteen, I went with classic and simple. and everyone picked a bag and colored away. Even the grandma and moms (and a dad) helped. Here are some of the decorated bags. I wish we had gotten photos of the striped bags - they were particularly spectacular. 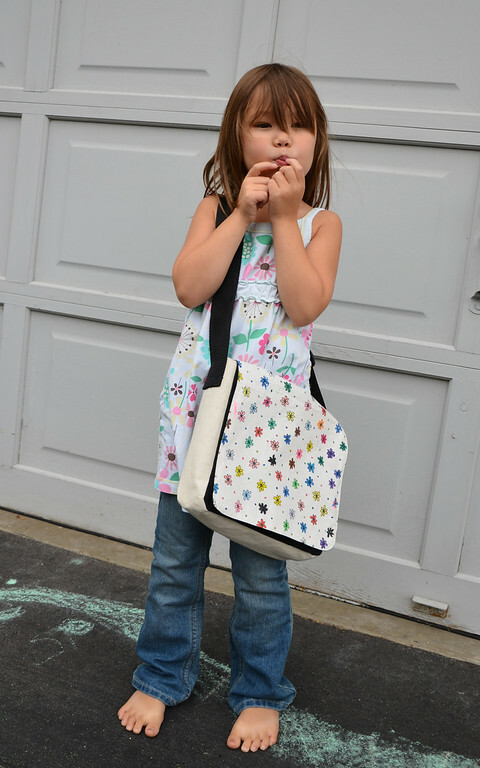 The girls use them to cart around their art supplies and coloring books, and they love how the diagonal strap leaves their hands free! 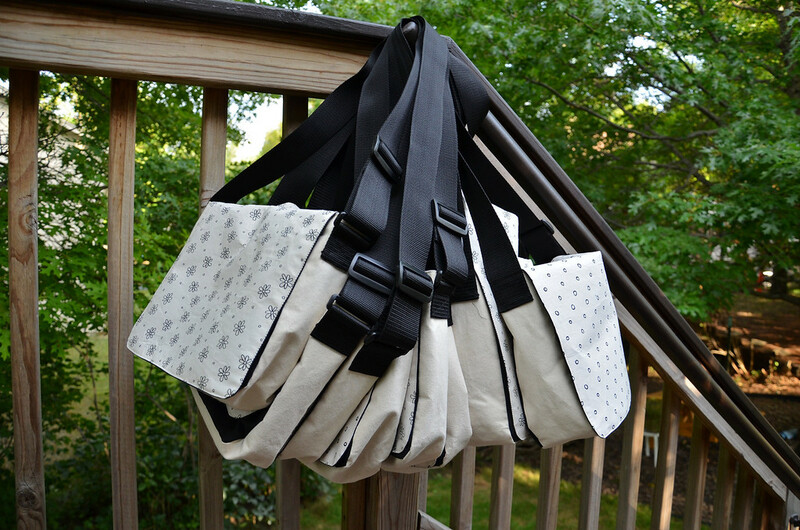 As a result of all the bulk-sewing, I have two bags to put in the shop! These are both in the versatile and classic polka-dot design, which, if you wanted, you could transform into flowers by drawing petals around some of the circles. 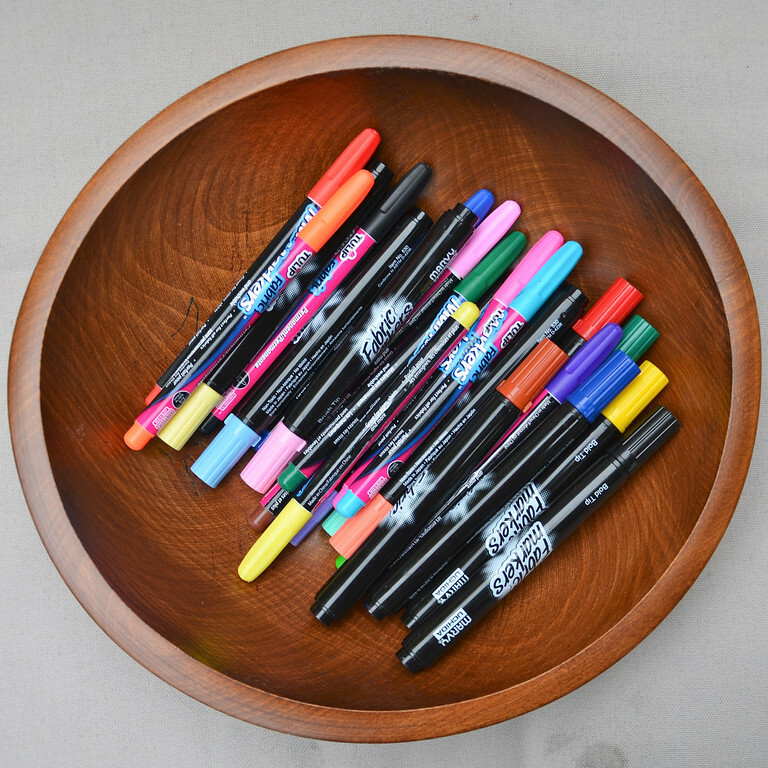 All you need is fabric markers! 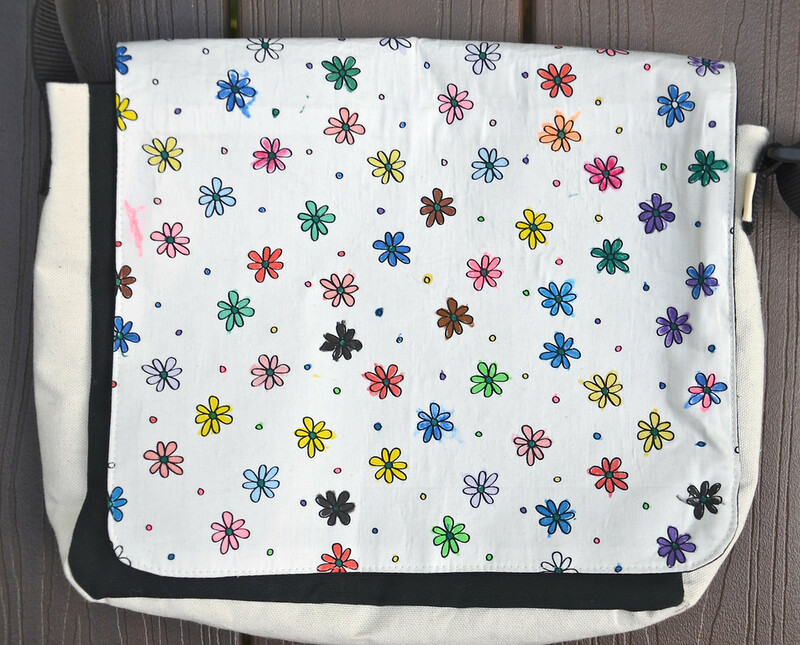 So if anyone wants a limited edition kid-sized decorate-able messenger bag, but doesn't want to make them, you can now buy them! Not quite in time for the start of school, but never to early for holiday shopping, right? How fantastic! A personalized treasure (holder) for each guest... wow!! That's more my idea of a great party than fancy decorations (although I would never have gone to all that work! ;) ) You rock, girl! And I thought *I* was nuts for sewing the goody bags for my daughter's 7th birthday! 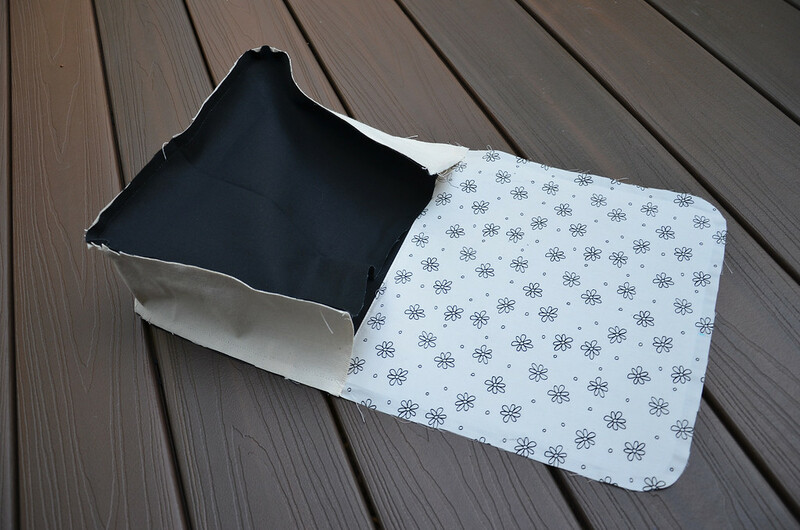 Ours were simple rectangular muslin tote bags with a twill tape shoulder strap. 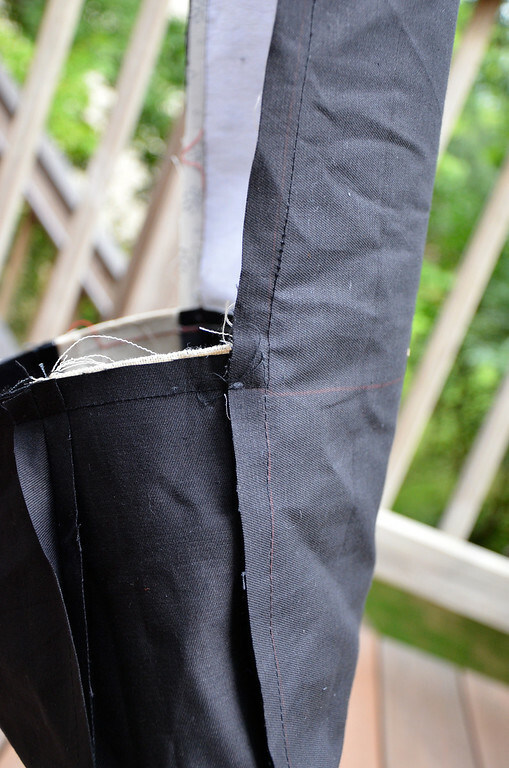 No gussets, no flaps, no interfacing, no lining, no slides or buckles. :) (The flowers-to-color are cute, but I assure you, kids this age are very happy to do their own artwork. In fact, my daughter prefers it; she considers coloring a bit babyish.) The birthday girl got a special strap in my house too, though! She picked out a fancy brocade trim to use for hers. Just gorgeous! Another fantastic, and useful idea. Well done. what a brillant idea!! thanks for the tutorial, although I have two boys I think this great present will probably be incluided on our next birthday party! Wow! What a party and those give aways! Fantastic! I love the way satchel sounds! You throw awesome birthday parties. Very lucky kids! Wonderful tutorial! Thank you so much! I would love to colour one of these myself! And I'm the ripe age of.....well lets just say ''Im not a kid". This is awesome. Might just try to make one tomorrow! Great tutorial! 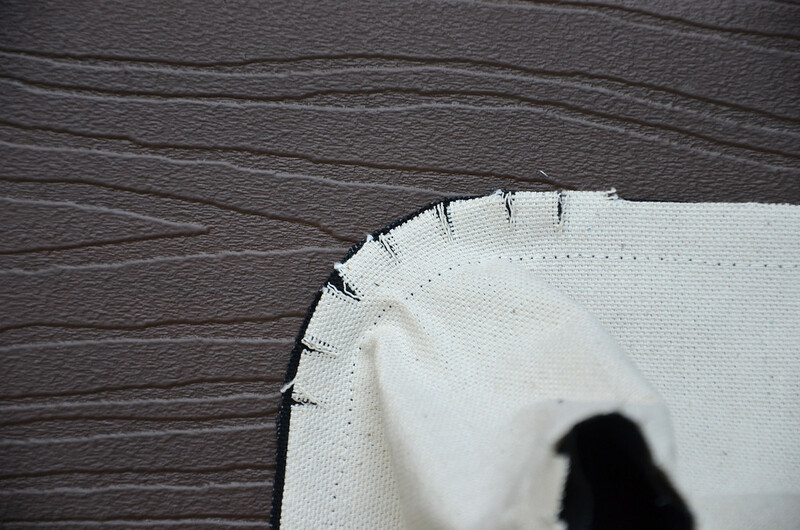 I love how you showed the progress of the bag as opposed to pictures of the pieces at the sewing machine. Great tutorial! Thank you! Great idea using them as a goodie bag for a party too! Very creative and I am sure you impressed everyone with your creativity. Thanks again! Thanks for the tutorial! It's well done and easy to follow, I love how you used these as goodie bags for your daughter's birthday party! What a fabulous idea! I bet you impressed everyone with your creativity! Thanks again! What a terrific party gift!! I once made custom pencil cases during one of my daughter's parties. The kids were old enough to entertain themselves so I had them choose their fabrics and stayed in my sewing room making them the whole time. By the time the party was over, they had their gifts, and I still had my sanity. 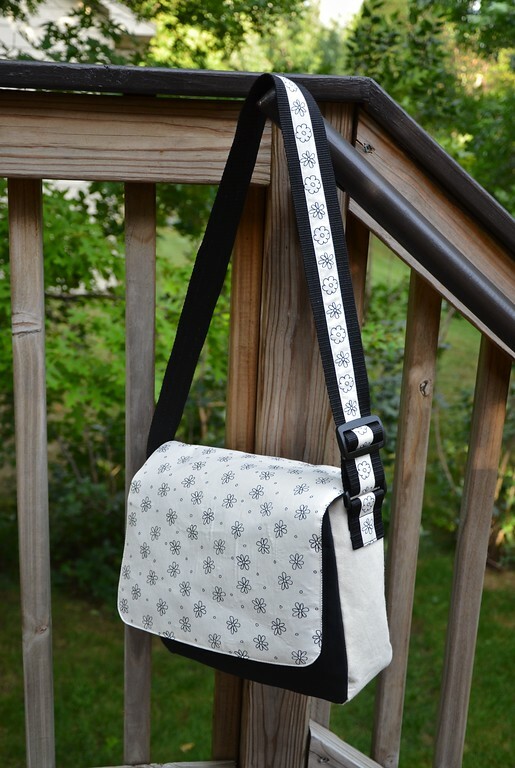 I stumbled across your site doing a search for messenger bag patterns to make for my husband for Christmas. Thank you for this pattern! I didn't even use your exact measurements, but customized them to get a size I wanted. Following your basic construction techniques, I added exterior and interior pockets to make it useful for a commuter. I've now been poking around your site and am so impressed with all the great ideas. Thank you! I love how different each bag looks after the kids have personalised them :) That's definitely going to have been a party the attendees remember for life. How can I add a side pocket? Where did you purchase the buckle system? I had a stash of the buckles from Singapore, where I often buy my bag hardware in bulk. However, you can buy them jn small quantities on etsy. 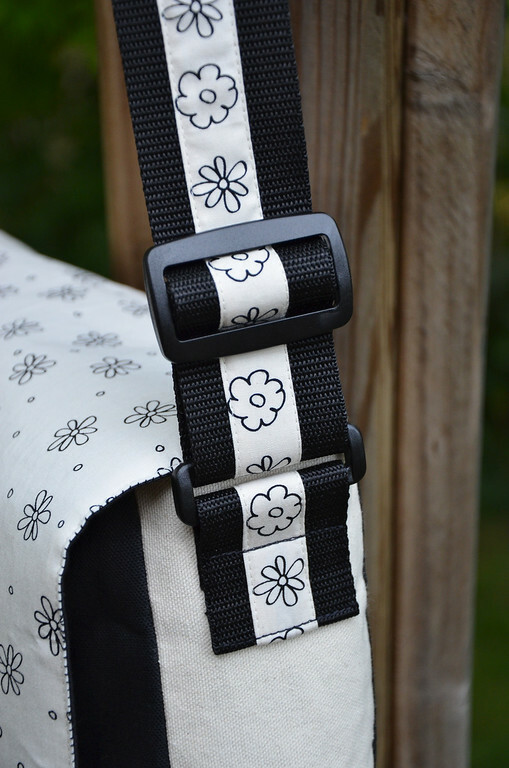 Google etsy+slide buckles. Narrow these down to plastic or metal, and by width (these were 2" but you'd buy whatever fits the webbing you're using). Great looking bag. Your photos and explanations are easy to understand. thank you. 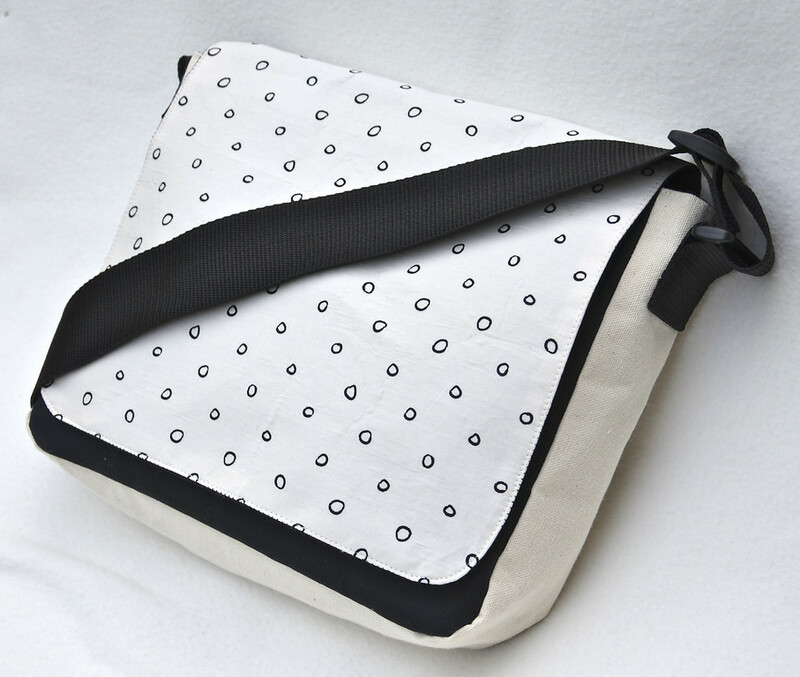 You can make a video tutorial with this messenger bag? Much easier tutorial to follow than some others I've seen. Not as confusing and well explained! Thank you!!!! I'm going to try to make one and adjust the size to fit my laptop. Could you make the back and flap piece all one piece instead of making a back piece and a flap and then sewing them together? Maybe there's a reason to do them separate? Thanks! Alicia: if you look at the cutting plan, you'll see that the back+flap+top of the gusset is cut as a single piece. However, for this particular backpack for my daughter's party, I joined the flap as a separate piece simply for piecing purposes: I wanted the Color-Me fabric to only be on the flap (it was very thin quilting cotton and I wanted to use as little of it as possible, and preferred the black twill for the main body of the bag, including the back piece). So, summary:yes, unless there is a particular reason for having it pieced from separate fabrics, cut the back+flap as a single piece as in the cutting plan. Tammy, I've just checked the link - it still goes to the download page. Click on the thumbnail of the layout page and it should open up to the download page @ mediafire, the site that hosts my pdf files. Hello, I am just start to interesting sewing. Can you guid me how much fabric and lining should I buy? Shannon: a yard of each is plenty.